Dear friends, World Correpondence Gomoku Championship is about to start! We are waiting for your applications at renjusignup yandex ru. Registration deadline is 22 Dec, so please hurry! With best regards, Epifanov Dmitry. Sorry, the deadline for registration is 20 Dec. 22 Dec is a scheduled start date. W turniejach rywalizują Angst (grupa C) oraz Usiek (grupa A). The world gomoku champion Zoltán László from Hungary is fighting a battle against the world correspondence renju champion Hao Tianyi from China in the world correspondence gomoku championship! The current position is shown below. The opening was put by Zoltán, and Hao Tianyi chose white. The time control is 135 days. The remaining time each player has is shown on the left. We see that the mighty Chinese is positionally outplaying the Hungarian, dominating and outpowering him. It seems obvious who is stronger, and it should not take too many moves before Zoltán gets pinned if he is not demoralised to continue at all. The last move made in this game was made more than a month ago. Correspondence gomoku is a battle of strategists. What decides in this sport is strategic planning, the ability to focus on important branches, systematic thinking, skills of computer analysis, and deep understanding of the game. Correspondence gomoku is devoid of tactical blunders, so you cannot trick your opponent by setting a simple tactical trap as you do in live tournaments. It is a sport for those who have a great passion for analysis and appreciate the deep beauty of the game. It seems that in this sport, the winner of the world gomoku championship is no match for the skilful Orient master. And it is no surprise to me. After all, gomoku is an oriental game. Correspondence gomoku is a battle of strategists. What decides in this sport is strategic planning, the ability to focus on important branches, systematic thinking, skills of computer analysis, and deep understanding of the game. W taki sposób, będąc niekoniecznie mocnym graczem, można odnosić wirtualne sukcesy. Is this why you play correspondence games, achieving already 311 virtual successes? Or why do you play correspondence games? And why do Vladimir Sushkov, Dmitry Epifanov, and Konstantin Nikonov play correspondence games? Vladimir Sushkov won the world correspondence renju championship in 2013 and 2014 and also won the world live renju championship in 2009 and 2017. Konstantin Nikonov won the world correspondence renju championship in 2001 and 2015 and won the Russian live renju championship in 2010 and 2016. Dmitry Epifanov won the world correspondence renju championship in 2007, took the silver medal of the same championship last year, and won the Russian live renju championship in 2013 and 2014. In the last world correspondence renju championship there were a number of strong live players, including Dmitry Epifanov, Vladimir Sushkov, Konstantin Nikonov, Aivo Oll, Tord Andersson, and Alexey Potapov. What makes these strong live players spend days and days to try to achieve virtual successes? Gram korespondencyjnie w Renju, ponieważ online za bardzo nie ma alternatywy. Ile znasz stron do grania Renju online z anglojęzycznym interfejsem i zasadą Soosyrv-8? Od kilku miesięcy takie kryteria spełnia piskvorky.net. W grze live potrzeba wszystkich powyższych poza skills of computer analysis. Jeśli masz wyniki online/korespondencyjne/advanced a jesteś słaby live, to masz problem z psychiką albo brakuje Ci komputerowej analizy podczas gry. You can also play Soosyrv-8 renju with an English interface on renju.in (the former renju.su). Below is a screenshot illustrating how you can create a game with the same time control as in the Euroleague, 10 min +3 sec. On that server you can also play in no-prog correspondence tournaments, i.e., correspondence tournaments in which it is NOT allowed to use programs. One of such tournaments in Soosyrv-8 renju starts in a week, on Wed 24 Apr, and its participants include Dmitry Epifanov and Alexey Lebedev: http://renju.in/en/turnaments/?tur=132 . The time control of that particular tournament is 45 days. So if you want to play without computer analysis, such tournaments are a good option. You only need to read the description of each tournament to see whether using programs is allowed or not. 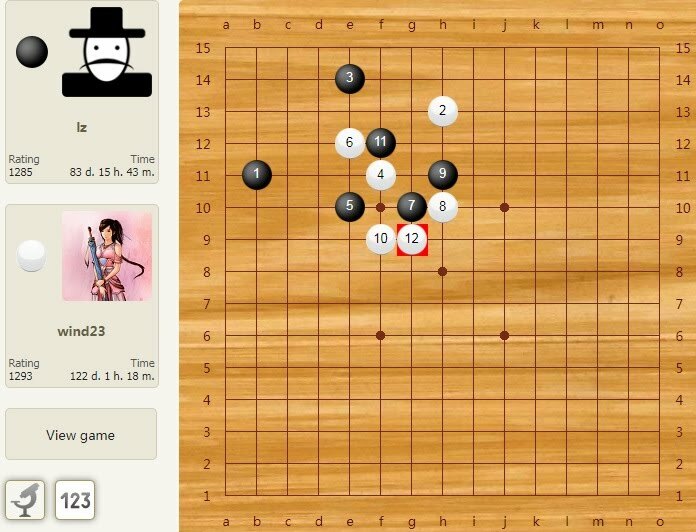 In no-prog correspondence tournaments you can use a real or virtual board to put stones for the purpose of analysing your position during the game, but are not allowed to run a gomoku engine. Practically all players there obey the rules, although there have been a few cheaters in the past. 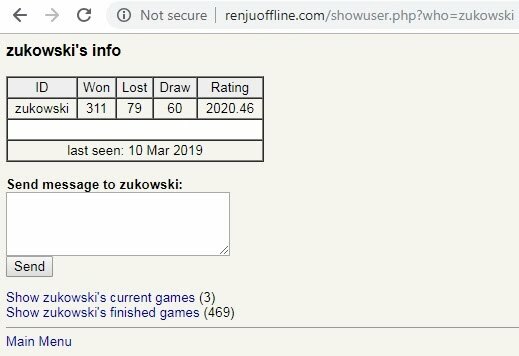 Looking at your statistics at renjuoffline.com, I see you that within the last six months, you finished 12 Soosyrv-8 renju games, 10 Tarannikov renju games, 10 Taraguchi renju games, and 10 Yamaguchi renju games, so you actually do not seem to strongly prefer Soosyrv-8. And if, as it seems, you just want a good balanced opening rule, not necessarily Soosyrv-8, you have a plenty of options to play renju online in real time. 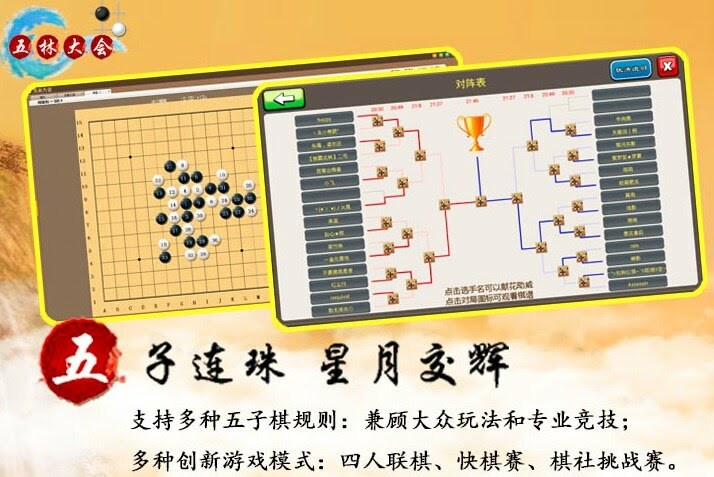 First, the Taiwanese renju community plays on tw.gamelet.com/game.do?code=fiveChess . 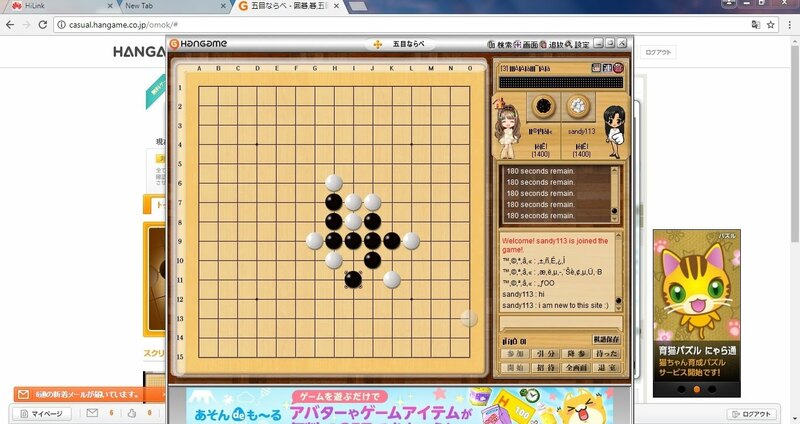 You can play Yamaguchi renju there, and I saw, e.g., Ko-Han Chen in the statistics on that server. The interface is Chinese, but I wrote a detailed instruction how to use it: https://vk.com/topic-19499145_35809185?post=31841 . To write the instruction, I asked a Taiwanese friend of mine to explain me the interface and then verified his explanations by playing there. Below is a screenshot I took during one of my games. Although there are very few visitors on that server at any given moment of time, you can simply create a table with the settings you want, and sooner or later you will hear a notification sound informing you that someone joined your table and wants to play. In the meantime, you can simply do other things on your computer. I myself played many games there, albeit in gomoku, not renju. Second, the Russians organise online renju tournaments on gambler.ru . The tournaments are played with the opening rule called ''пять реверсов,'' literally ''five swaps.'' I guess this opening is known internationally as the Tarannikov rule, but I may be mistaken. The time control is 7 min + 4 sec. To play in Gamber tournaments, you have to install a special program, where you can choose an English interface. If you are interested, I am sure the Russians will gladly help you get started, as the interface is somewhat confusing if you see it for the first time. By following the links above, you can even have a look at the individual games. My nickname there was sandra113, spelt exactly as my Kurnik nickname. As you can see, in these tournaments I faced, in particular, Dmitry Epifanov (who played under the nickname Owen), Alexey Skuridin (who played under the nickname skuridin), and Alexander Razdevelyuk (who played under the nickname Полина_11). They are well-known Russian renju players. Being a complete novice in renju, I stood no chance against them, but it was an interesting experience. As you can see on the schedule (https://www.gambler.ru/tours/?online=1&game=35&first=1&lim=20&max=3037 ), the Gambler renju tournamaments are set to start at 21:00 Moscow time each Monday, Wednesday, and Friday, but are actually played once per two months or so. That is, usually no one or almost no one comes, which results in an insufficient number of people for the tournament to start, but sometimes people come together to play, apparently as a result of arranging in advance. The last played tournament was held about a month ago, on 22 Mar 2019: https://www.gambler.ru/tour/691593 . The last but one tournament was played about two months before that, namely on 29 Jan 2019: https://www.gambler.ru/tour/681356 , and fourteen players participated in it, including Denis Kachaev, Ilya Katsev and Alexey Skuridin. Even if you are unwilling to ask anyone to help you, you can learn by trial and error, as I did one-and-a-half years ago on a Japanese renju server. I passed a Japanese captcha by using the Google handwriting tool, installed the required program in order to access the server, and, despite almost everything being in Japanese, managed to play renju games there. Below you can see a screenshot of one of my games, where you can see me under the nickname sandy113. The server is apparently no longer operational, but worked at that time. Its URL was casual.hangame.co.jp/omok . По многим людям там сильно неудачные данные. Барыкин становился чемпионом мира году так в 2006 - ну и возьмите его рейтинг на тот момент, будет примерно 2200, думаю. В последнюю ВЛ его позвали за пару дней до начала, он не готовился вообще - отсюда итог. Ну и вообще получается, что заочный рейтинг десятилетней давности, а очный - текущий, нехорошо. И, кстати, в предыдущей его вышке при двух пропущенных турах он стал, емнип, восьмым, обидев многих сильных игроков. Не было бы проблем транспортных (до Волгограда далековато), может, и в шестерку попал бы. Опять же, Сушков сейчас после пары не лучших в карьере турниров. Далее, традиционно Россия очень сильна заочно (только сейчас в Китае наконец-то нашлись нам блестящие соперники), при этом по отдельным причинам средний рейтинг россиян стабильно падает год от года, что вносит систематическую погрешность в твое исследование, тобой не учтенную, и даже на Сушкове сказавшуюся. Про многих игроков у тебя просто нет информации. Так, Баланова, когда играла очно, была весьма сильна - на уровне медалей современного чемпионата мира среди женщин, как минимум. Старики не дадут соврать. Coco Yuang, Sun Chengmin, Bai Shi, Qi Da Nei, Qi Ya, даже Song Xian (и еще несколько) - это фейки пары относительно известных и весьма сильных китайцев. Федулина Татьяна и Ибрагимова Мариам - если не изменяет память, фейк известного (и относительно крепкого) российского игрока. В общем, исследование пока так себе. Data on many people are really inappropriate or misleading there. Barykin became the world correspondence champion in about 2006, so take his live rating of that time. It is about 2200, I think. Concerning his participation in the last High League, he was invited just a couple of days before its start, so he did not prepare at all, hence such a result. Overall it is bad that while you take his correspondence rating earned a decade ago, his live rating is taken as recently changed. And, by the way, in his previous High League he took, if my memory serves me, the 8th place despite skipping two rounds. He bit off points from many strong players in that tournament. If he had had no travel issues (related to the high distance from his city, Volgograd), he might have finished in the top 6. Also, Sushkov's performance in his last two live tournaments was not his finest hour at all. Moreover, while Russia is traditionally very strong in correspondence renju, with the Chinese having finally become strong opponents only recently, the average live rating of Russians has been falling since years ago for various reasons (unrelated to the actual level of play), and this introduces a systematic error in this investigation. This error is not taken into account in this investigation and even affected where Sushkov is. Significant information is missing about many players on the list. For example, Balanova was very strong in live tournaments, with her level at that time being no worse than the current level of modern medal winners of woman's world renju championship at least. People who played at that time will correct me if I am mistaken. Coco Yuang, Sun Chengmin, Bai Shi, Qi Da Nei, Qi Ya, even Song Xian, and a few more are fakes that were operated by two relatively known and quite strong Chinese. Tatyana Fedulina and Mariam Ibragimova are, if my memory serves me, fakes that were operated by a known and relatively decent Russian player. So overall the investigation is not of good quality at all. 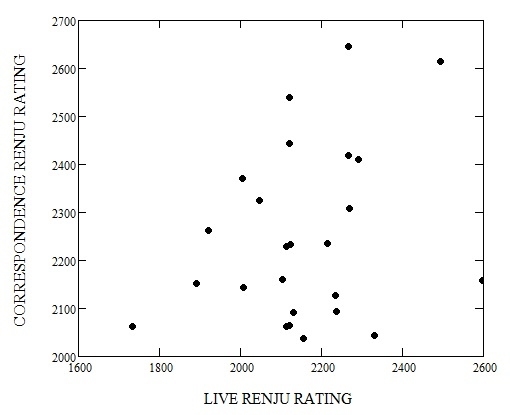 Motivated by him, I decided to perform a serious investigation to find out whether there is a correlation between the level of play in correspondence renju and the level of play in live renju. To do so, I decided to use only data of Russian players, because there are systematic differences in live ratings between different countries, i.e., one and the same level of play corresponds to different ratings in different countries. Furthermore, I decided to take only those players who are still on the live rating list of active players, i.e., only those players whose last live performance dates back to no more than five years ago. This removes the systematic error caused by the effective change of the rating scale with time, i.e., one and the same level of play corresponds to different ratings nowadays and many years ago, and I wanted to remove that factor. I also excluded Barykin from the statistics because of the reasons explained by Dmitry Epifanov. I did not exclude anyone except Ekaterina Glibina, for she has a very odd live rating (1321) and may have been helped by others in her correspondence games, especially as the live rating list contains Alexey Glibin, apparently her relative. I calculated the Pearson correlation coefficient, and it turned out to be equal to 0.27. That is, the correlation is 27%. The actual correlation between the live and correspondence levels must be even stronger, because a number of players in the above statistics (e.g., Berezin and Kozhin) failed to finish many games in their last correspondence championships, which resulted in automatic losses and big negative changes of the ratings. The resulting ratings of such players do not reflect the actual correspondence level of play and thus worsen the correlation. For these 13 points the Pearson correlation coefficient is 0.54, i.e., the correlation is as strong as 54%! The correlation is so strong that it can be easily seen in the graph by the naked eye. 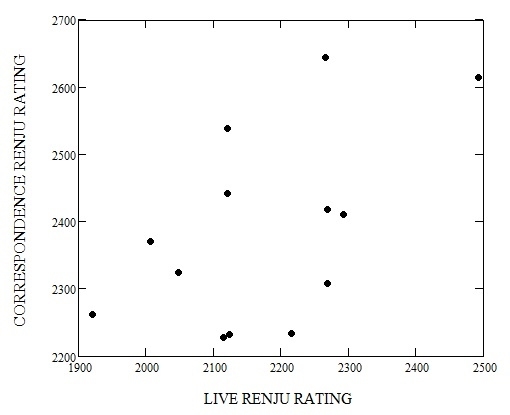 The conclusion is simple: There is a certain substantial correlation between the level of play in correspondence renju and the level of play in live renju. Of course, correspondence renju and live renju are different sports, but there are some factors resulting in that strong live players are more likely to succeed in correspondence renju and vice versa. Live games are about the ability to solve things in mind. You sit at the board for hours and think, think, and think, being not allowed to even make records of your thoughts. The competition is in a large extent about the ability to store and process heaps of data in your short-term memory without writing anything. The greatest legend of the gomoku world, Attila Demjan, was famous for his exceptional calculation skills. But is this ability - the ability to solve complex things in mind without writing anything - really needed in real life? I worked in science for many years and can assure you that even top scientists are not really different from ordinary people in the ability to, for example, multiply big numbers in mind. When people analyse complex things, they make records. They do not think for hours without writing anything. In research, we use many tools - computers, programs, equipment, etc. Even when we make simplest calculations to derive some simple formulas, we use at least a pen and paper. In real life, you need two abilities: (i) the ability to quickly think in, e.g., oral negotiations, and in order to quickly get routine things done, (ii) the ability to carefully and scrupulously analyse and decide on complex issues by using any means you can use, such as a pen, paper, computer, books, data records, etc. Ability (i) corresponds to blitz games, and ability (ii) corresponds to correspondence games. The ability to solve complex things in mind by thinking for hours without making any records - as required in classic live games - is something not really needed in real life. And if someone is an outstanding player in correspondence games and just an average player in live games, he may simply not have developed the ability to calculate far in his mind. He may have simply not been motivated to develop this ability, in the first place. What, after all, use could he make of this ability beyond live tournaments? And if you see only, say, 3-5 moves ahead, you cannot do much in live tournaments regardless of how well you understand the game. Correspondence games are about the ability to perform a great analysis and about research skills. By playing correspondence games, you learn a serious approach to strategy and planning. You learn a serious approach to analytical work. You learn long-term discipline. You learn to make very elaborated plans and stick to them. You become a great analyst and develop very useful analytical skills. And you can use these skills in everyday life to take important decisions - e.g., devising a tax evasion scheme, starting a business, making important career decisions, etc. You do not need to make decisions on such matters in your mind without making any records, but you need to be able to perform serious analytical work using any means you can. So playing correspondence games well may be, in fact, more useful than playing live games, contrary to what many people might think.